PT Astra Honda Motor - PT AHM is a reputable foreign investment company in Indonesia that is involved in automotive industry. Based in Jakarta, AHM has principal business in motorcycle industry. AHM running business in manufacturing, distributing and marketing of Honda Motorcycles for the domestic market and export market. PT Astra Honda Motor is a multinational joint venture company between Indonesia PT Astra International Tbk with Japan Honda Motor Company Ltd, with a shareholding composition of 50% each. 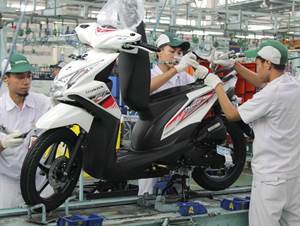 PT Astra Honda Motor is widely known nationwide as the pioneer in motorcycle industry in Indonesia. According to information found in the Company's website as cited by JobsCDC.com, the Company was first established in 1971 as PT Federal Motor. In 2000, Astra Group restructured its motorcycle business by merging PT Federal Motor and PT Honda Federal into PT Astra Honda Motor. PT Astra Honda Motor now has installed total annual production capacity of 5.8 million units through its 4 production facilities; Sunter Assembly Plant, Cikarang Assembly Plant, Pegangsaan Assembly Plant, Karawang Assembly Plant and Part Centre. The Company also supported by Astra Honda Training Centre Sunter. S1 Informatics Engineering, Information System with minimum GPA of 3.00. Have a good responsibility and commitment. Fluent in Indonesian and English (oral and written). S1 Statistics, Industrial Engineering, Business Management with minimum GPA of 3.00. Able to work in teams and have the soul of customer service (energetic, nimble, and helpful). Able to perform problem analysis and problem solving by including real data. Have a high durability and stress resistance. S1 Industrial Engineering, Electrical Engineering, Mechanical Engineering, Management, Communication with minimum GPA of 3.00. Deeply interesting in analysis related numbers and data. D3 Electrical Engineering, Mechanical Engineering, Material Engineering, Metallurgical Engineering with minimum GPA of 3.00. Diligent, thorough, honest and responsible and able to analyze well. Able to analyze well every problem that occurs, and make correct improvements. Able to think logically systematically and can cooperate well. S1 Industrial Engineering, Management, Economics, Communication with minimum GPA of 3.00. Have good communication skill, both oral and written. Willing to travel throughout Indonesia including to remote areas. S1 Industrial Engineering, Management with minimum GPA of 3.00. Hard worker and have a good responsibility. Deeply interesting in detailed and in-depth analysis. Have a high curiosity and critical. Willing to travel out of town for business trip. Have good presentation and communication skills with other people with different job title and age. S1 Industrial Engineering, Electrical Engineering, Mechanical Engineering, Metallurgical Engineering, Material Engineering, Management, Communication with minimum GPA of 3.00. Happy to riding and have SIM C.
Easy to adapt in various aspects of the environment, especially related to education. Deeply interesting in the field work. D3 Mechanical Engineering, Electrical Engineering with minimum GPA of 3.00. Dare to communicate and coordinate with all ages. Solid understanding of the manufacturing production process. D3 Electrical Engineering, Mechanical Engineering, Accounting, Communication with minimum GPA of 3.00. Dare to propose alternative solutions to the problems that occur. D3 Electrical Engineering, Mechanical Engineering, Management, Communication, Accounting with minimum GPA of 3.00. Able to work with the team and have the soul of customer service (energetic, nimble, and helpful). Able to process the data with existing tools (such as Ms Excel, Power Point, etc.). High durability and stress resistance. D3 Mechanical Engineering, Electrical Engineering, Management, Communication, Accounting with minimum GPA of 3.00. Maximum age of 20 years old. SMA or equivalent with minimum Raport Value of 6.50 and minimum average SKHUN score of 6.50. Minimum Mathematics score per semester of 6.00. Not color blind and not wearing glasses. S1 Marketing Management, Economics, Industrial Engineering, Visual Communication Design, Graphic Design with minimum GPA of 3.00. S1 Architecture, Architecture Engineering with minimum GPA of 3.00. Fluent in English oral and written (passive). Diligent, initiative, nimble, tough, meticulous. S1 Electrical Engineering, Industrial Engineering with minimum GPA of 3.00. Good problem-solving skill to determine the right solution. Able to control (PDCA) on an activity. Able to adapt and communicate well. D3 Chemical Engineering with minimum GPA of 3.00. Have good communication and teamwork skills. Have drive and unyielding spirit. S1 Industrial Engineering, Electrical Engineering, Mechanical Engineering, Material Engineering, Metallurgical Engineering, Management, Communication with minimum GPA of 3.00. Solid understanding about the process of component production in general. Have a good commitment and responsibility. Abstinence surrender in the face of obstacles. S1 Industrial Engineering, Informatics Engineering, Management with minimum GPA of 3.00. Deeply interesting in data processing. S1 Industrial Engineering, Mechanical Engineering, Product Design, Management with minimum GPA of 3.00. Have a good knowledge and understanding about the two-wheeled business in Indonesia. Have a good knowledge and understanding of the details of automotive products, especially two wheels. Have a good knowledge and understanding of market research / product / customer. Advanced skill in conducting cross variable analysis to all data related to market, product, consumer and financial / investment aspect. Able to lead cross-division work teams as well as adequate knowledge and understanding of project and resource management. Have good ability and effective communication in conveying the superiority of a product. Have advanced skill in operating word software, spreadsheets and presentations. S1 Industrial Engineering, Electrical Engineering, Mechanical Engineering, Material Engineering, Metallurgical Engineering, Management, Communication, Informatics Engineering with minimum GPA of 3.00. Have the ability to analyze problems by including real data. S1 Communication, Marketing Management with minimum GPA of 3.00. Able to develop and create new programs as well as execute activities well. Fluent in English (passive and / or active). Hard worker and have high sense of responsibility for every tasks and jobs. Have passion and high curiosity towards motorcycle. Have a good communication skills and easy to get along with others from various fields, position and age. Have good analytical and logical thinking skills. Have quick response in learning new things. Willing to travel out of town for a business trip. S1 Mechanical Engineering, Electrical Engineering with minimum GPA of 3.00. Have spirit and deeply interesting in a racing competition. Able to analyze the results of racing, as well as parts and backup specifications according to race requirements based on race results. Solid knowledge in accordance with the specified specifications. Strong physical and resistant to working and weather pressures. S1 Accounting, Finance Management with minimum GPA of 3.00. Thorough and likes to work with numbers. Have a good interpersonal skill, able to establish good relationships with other divisions in AHM. Advanced knowledge about the concept of financial management. Have excellent Excel skill (eg pivot, vlookup, formula). Able to thinking and working structurally and systematically. Have good communication skill and teamwork. Have a good drive and unyielding spirit. JobsCDC.com now available on android device. Download now on Google Play here. Please be aware of recruitment fraud. The entire stage of this selection process is free of charge. PT Astra Honda Motor - Fresh Graduate Operator, Analyst, Engineer, SPV AHM January 2018 will never ask for fees or upfront payments for any purposes during the recruitment process such as transportation and accommodation.